The second son of the acclaimed artist Jacopo Bassano (1515 – 1592), Leandro worked with his father and older brother Francesco (1559 – 1594) in the town of Bassano del Grappa. Leandro followed in the tradition of his father’s religious works, but also became well know as a portrait painter. By around 1575, Leandro had become an important assistant to his father, with his brother relocated to Venice. It was his father’s will that Leandro carry on the studio in Bassano del Grappa. Though after his father died, his brother Francesco tragically committed suicide and Leandro took up the studio in Venice. There he became a successful portraitist, working close to the influential style of the Venetian master, Tintoretto (1518 – 1594). His success grew substantially in Venice, even landing him a knighthood from the Doge of Venice (Marino Grimani) sometime in the late 1590s. With this, Leandro began to sign his name with the honorary, “Esques” (N. Pioch, WebMuseum). Much of his work is not clearly dated and his works have sometimes been confused with other artists. This is the case with his, Portrait of an Old Man in the Museum of Fine Arts of Budapest, which was once thought to be a work of Tintoretto. 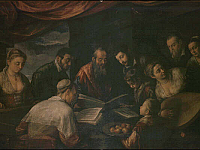 Additional to his many portraits and religious pieces, Leandro painted secular, genre-like works, such as his, Concert, now in the Uffizi Gallery.